Sons of Steve Garvey: Does This Merit a Post? Does This Merit a Post? Blanton was out of baseball in 2014, retiring after just two Triple-A starts in the A's system, one year after putting up a 6.04 ERA in 132⅔ innings with the Angels in 2013. But he made a triumphant comeback in 2015, first with the Royals then with the Pirates, put up a 2.84 ERA and 2.92 FIP in 36 games, with 79 strikeouts ad 16 walks in 76 innings. But after making four starts with Kansas City, he found a home in the bullpen. 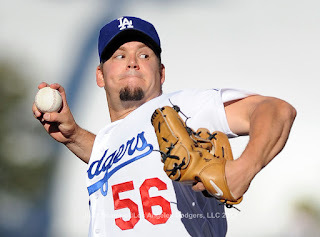 Blanton in relief last year put up a 2.04 ERA and 2.56 FIP in his 32 relief appearances, with 62 strikeouts (a 27-percent strikeout rate) and 12 walks (only seven unintentional walks) in 57⅓ innings. His ground ball rate as a relief pitcher in 2015 was 48.4 percent, up from his 44.4-percent career rate. One of the rare pitchers the Dodgers actually BEAT in the NLCS? Fantastic! LAD to Add AA to FO?